If you look at the map, you will notice that Batang Ai is a huge lake with multiple rivers flowing into her. Batang Ai is at the Lubok Antu town. For Lubok Antu, is a district in Sri Aman division in the state of Sarawak. Its near to the border of Indonesia (Badau), and the people here mostly are the Iban, follow by the Chinese, Malay, and other Dayak people. And to drive from Kuching to Lubok Antu, you will need not more than 4 hours. Before my friends and I went to Lubok Antu, we stop at a town called Betong for a rest. Betong it’s the 11th administrative division in Sarawak, and it’s also famous for the rubber taping, the pepper, paddy, and oil palm plantation. There is a rubber tree at Betong town center as a symbolic signature, and I also saw an old guy with just his pants on (half naked) standing at the middle of the street. My friend told me that this guy wears like this all year long, expect for Chinese New Year, then he will wear a red shirt. And he’s been doing so for several years already, and the people in this town know him. 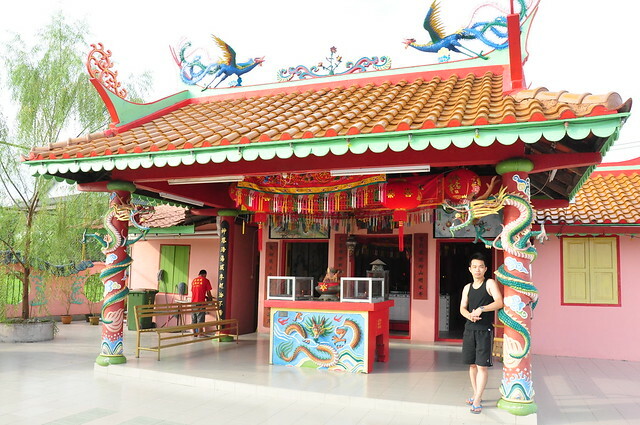 I also visited the only Chinese temple at Betong, it’s the “temple of God” and I bring my Iban and Bidayuh friends into the temple too, they told me that’s the first time they ever visited the Chinese temple… tisk tisk… not bad. The top photographer Wilson Chin and Dragon. Next destination it’s the Lubok Antu town. Batang Ai is near to the Lubok Antu town, and the form of Batang Ai is because of the dam which the Sarawak government builds during the 80s. The gov employ the Japanese to come and build the dam, and they work in shift rotation. That’s why the dam completed on time. 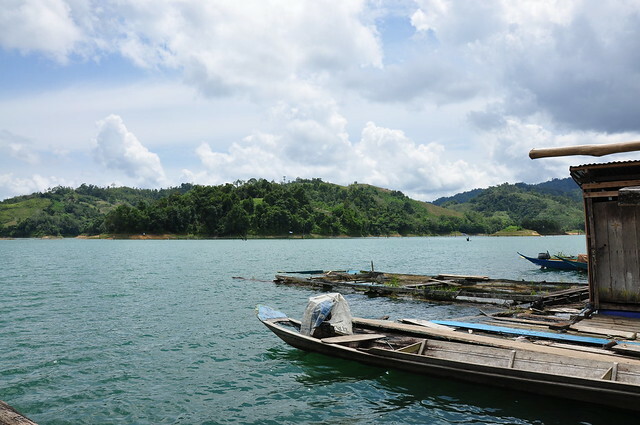 Before the dam, it takes days for the village people to reach from Lubok Antu town back to their Batang Ai long house by land. And now after the dam, the water flooded a large scare of land, which also shorten the distant for the village people to go back to their long house, and now it only takes a few hours, so there are huge different. When you reach the Batang Ai (Batang River), the water is just calm. Every now and then you can see some ripples on the water cause of winds. The water is blue to greenish color, and there are also a lot of small humps (Small Island) here and there. The boat ride is around 45 minutes, and along the way there are boats passing by frequently. This area is so remote as now we can only access it via boat. 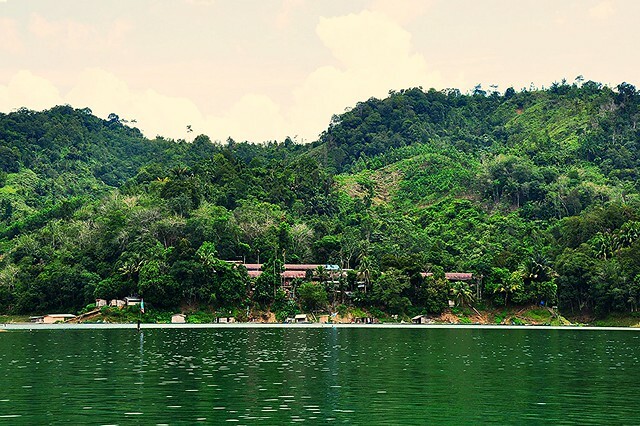 There is a resort here which belongs to Hilton, the Batang Ai longhouse resort. 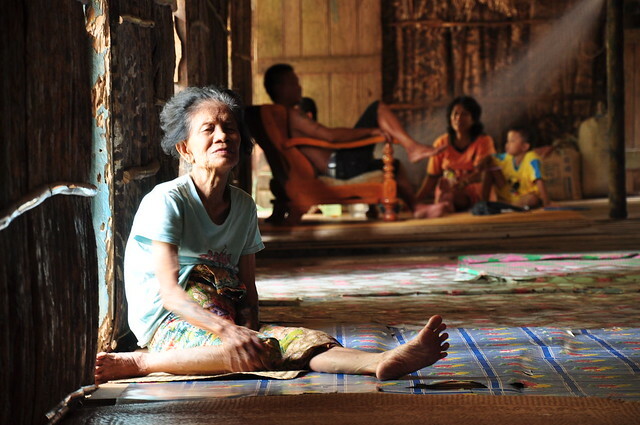 For tourist, this will be the place for them to stay, as for us we are going to the traditional longhouse. 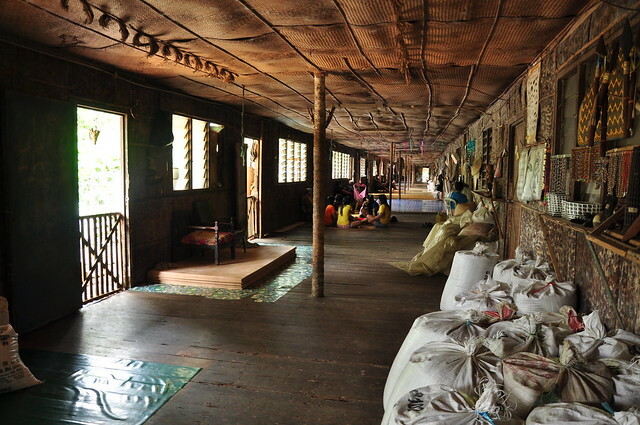 The longhouse is called Mngkak Eengkari, and it’s a traditional Iban longhouse with 21 doors (21 rooms). The village people also build a few jetty in front of the long house for few purpose, to catch and raise fishes, to store the boat engine, petro, nets, and also serves as a resting hut whey the fisher man came back from fishing. They are using two generators to generate electricity, operate at around 7pm generator no.1 will shut down at 9.30pm, and generator no.2 off at 10pm. After that it’s just the light from the stars. My friend and I went to sit next to the jetty hut at around 10.30pm. It was so quiet there, with just the sound of the nature like the forest, the bugs, frogs, and breeze. There are a few fire flies flying on the ceiling on the hut we’re at. This is just completely different from the city life; here they don’t have computer, no mobile coverage, no internet, and no fancy technology. The one that I like most is the stars on the night sky, if the one that I love is there with me that time I will hold her close to me, and kiss her tenderly under the starts. The peaceful life here will vanish in a few more years, as the longhouse chef told my Iban friend (and my friend translates to me) that the government now plan to take their land for some reason. They are also been prohibit from doing any kinds of tourism, agriculture activities on their own. All of these must go through the big guy in the office, in other words they need some permit to do so. The chef told us that they like their life now, they just want a place to stay, food on the table, a place where they can retain their tradition. But the authorities use all kinds of dirty tactics to get the lands, and eventually use it as oil palm plantation or wood logging. When seeing the kid wave good bye to us while we’re leaving, I felt that I come with a happy heart, but left with a sad feeling. I can’t do much on my own, but I believe if we all work together, all of these... the nature, the tradition, and the culture can be preserve. We don’t want our children in future only learn all of these in text book, but we want them to experience it in real life anytime they want to. Lets make Sarawak a nice place to stay.